Nickname(s): "The Queen City", "A-Town", "Band City USA", "Peanut City", "Silk City". Allentown (Pennsylvania Dutch: Allenschteddel) is a city located in Lehigh County, Pennsylvania, in the United States. It is Pennsylvania's third most populous city, after Philadelphia and Pittsburgh, and the 222nd largest city in the United States. As of the 2010 census, the city had a total population of 118,032 and is currently the fastest growing city in Pennsylvania. It is the largest city in the metropolitan area known as the Lehigh Valley, which had a population of 821,623 residents as of the 2010 U.S. Census and which in turn constitutes a portion of the New York City Metropolitan Area. It is also the county seat of Lehigh County. In 2012, the city celebrated the 250th anniversary of its founding in 1762. Located on the Lehigh River, Allentown is the largest of three adjacent cities that make up a region of eastern Pennsylvania and western New Jersey known as the Lehigh Valley. Allentown is 50 miles (80 km) north of Philadelphia, the fifth most populous city in the United States, 80 miles (130 km) east of Harrisburg, the state capital, and 90 miles (140 km) west of New York City, the nation's largest city. President Theodore Roosevelt addressing a crowd of supporters from the balcony of the Hotel Allen, 7th and Hamilton Streets, in 1914. Photo of Center Square (Seventh and Hamilton Streets) prepared for the Victory/Peace parade after the Armistice with Germany, 11 November 1918. Decorated lavishly is the "Peace Pavilion" (foreground) and the "Soldiers & Sailors Monument", which was dedicated in 1899 in honor of the Pennsylvania Volunteers' 47th Regiment in support of the Union in the American Civil War. Main entrance to Dorney Park & Wildwater Kingdom, 1950. Prior to the 1830s, Allentown was a small town with only local markets. The arrival of the Lehigh Canal, however, expanded the city's commercial and industrial capacity greatly. With this, the town underwent significant industrialization, ultimately becoming a major center for heavy industry and manufacturing. While Allentown was not as large as neighboring Bethlehem at the time, the local iron industry — which included the Allentown Iron Company (established 1846) and the Allentown Rolling Mills (established 1860) — employed the majority of Allentown's workforce. Railroads, such as the Lehigh Valley Railroad, were vital to the movement of raw materials and finished goods, and employed a significant workforce during this time. This period of rapid economic growth in the region was halted by two events, the Panic of 1873 and the Long Depression. Economic recovery in the early 20th century was brought about by the silk and textile industry. The Adelaide Silk Mill, one of the largest in the world at the time, opened in Allentown in 1881. By 1928, there were more than 140 silk and textile mills in the Lehigh Valley, making it the second largest industry in the region. By the 1930s, the silk industry was in worldwide decline, as synthetics were taking the place of silk. Catoir Silk Mill, the last silk mill in Allentown, closed in 1989. In 1905, Mack Trucks moved to Allentown, beginning Allentown's focus on heavy industrial manufacturing. Today, Allentown's economy, like most of Pennsylvania's, is based in the service industries with some manufacturing. Deindustrialization has caused many of the factories and corporations headquartered in Allentown to close or move. For example, Mack Trucks is now located in Greensboro, North Carolina, LSI Corporation (formerly Western Electric, later Agere Systems, which merged with LSI Logic) moved its headquarters to California, and numerous factories have ceased operation. On the other hand, the Allentown Economic Development (AEDC) operates a business incubator, the Bridgeworks, which helps attract and support young commercial and manufacturing businesses. Allentown lies in the transition between a humid continental and humid subtropical climate (Köppen Dfa/Cfa, respectively), although lying closer to the former. Summers are typically hot and muggy, fall and spring are generally mild, and winter is cold. Precipitation is almost uniformly distributed throughout the year. The average temperature in January is 27.8 °F (−2.3 °C), and the lowest officially recorded temperature was −15 °F (−26 °C) onJanuary 21, 1994. July averages 73.4 °F (23.0 °C), and the highest temperature on record was 105 °F (41 °C) on July 3, 1966. Early fall and mid-winter are generally driest, with February being the driest month with only 2.75 inches (70 mm) of average precipitation. Center City Allentown. At 322 feet (98 m) tall, the headquarters of PPL is the tallest building in Allentown. An 8,500-seat arena, including sports bar and retail shop. Estimated cost: $177.1 Million Dollars. An eight-story office building for Lehigh Valley Hospital's sports medicine center, which will occupy floors two through six. The first floor will be retail space and a sports bar, with floors seven and eight open for a yet-to-be-signed lease. The building will be a finished shell that will require what could be tens of millions of dollars more to customize it. Estimated cost: $24.5 Million Dollars. A 180-room hotel, restaurant and banquet center. The building will need millions of dollars more in finishing touches by a yet-to-be-determined national chain. Estimated cost:$23.5 Million Dollars. Two parking decks to be owned by the city. One five-story parking deck with 640 spaces is to be built on Linden Street, behind the hotel. A second parking lot, this one 120-spaces, is to be built under the office building on Hamilton Street. Estimated cost: $19 Million Dollars. Two additional structures, One City Center and Two City Center are planned. One City Center is a $50 million office complex that would include a 570-space underground parking garage with an estimated capacity of more than 700 mostly white-collar office workers. One City Center is proposed for the southeast corner of 7th and Hamilton Streets on Center Square. Two City Center will be located on the northeast corner of 7th and Hamilton Streets. Demolition of the former First National Bank began for Two City Center in October 2012. Two City Center is under contstuction. In addition, the Americus Hotel, located at 6th and Hamilton Streets is currently under renovation, partially funded by NIZ monies. The Farr Building, at Eighth and Hamilton streets, and the vacant Dime Savings and Trust Company Building, at Seventh and Hamilton, were retained and are being incorporated into the project. The project has generated considerable concern centered on the huge cost of the endeavor from funding a plan with no cap. The estimated cost of the project is currently at $277 million. As of October 2012, $224.3 million in bonds have been sold. Allentown's Center City neighborhoods mainly consist of a variety of Victorian and Federal rowhomes. The stately homes around West Park are mostly Victorian and Craftsman. The houses on the city's tree-lined streets in the West End were mostly built in the 1920s and 1940s. Houses in the City's East Side and South Side are a mixture of architectural styles and are generally single and twin family homes built from the 1940s through the 1960s with century old Victorians in the mix. Allentown also has loft apartments in converted mills and historic brick manufacturing buildings and modern and historic high-rise apartment buildings. Civic Theatre of Allentown has an 80-plus year history of producing theater in the Lehigh Valley. Started by two Morning Call reporters in 1927 as "Civic Little Theater", the current day Civic Theater of Allentown relies on a paid professional staff, volunteer board of directors from the community, and volunteers from the region. Civic Theatre stands on three pillars: theater, film and education. Civic is a professionally directed, managed and run theater that utilizes community actors in its live theatre productions. Civic also operates the Lehigh Valley’s only full-time cinema exclusively showing art, independent and foreign films and a theatre school that has been served the Valley’s youth for more than 50 years. In March 2011, plans were announced for the creation of PPL Center, an 8,500-seat arena to be built in Allentown, which is planned to be the future home for the Adirondack Phantoms, the American Hockey League affiliate of the Philadelphia Flyers. The arena will be located in downtown Allentown, taking up the entire block between 7th and 8th Streets and Hamilton and Linden Streets. In a controversial decision, the city has invoked eminent domain to help obtain the necessary properties and a contractor is expected to be chosen in 2012. In January 2012, buildings on the current site began to be demolished to make room for the new arena. Construction on the site, however, was placed at a temporary standstill pending litigation on the legality of the financing of the arena. In summer 2012, however, the lawsuits were dropped and the project was resumed. The arena is expected to be completed in 2014. The team's name will be the Lehigh Valley Phantoms. Allentown was home to the Pennsylvania Stoners, a former professional soccer team. From 1979–1983, the Stoners were members of the American Soccer League. The team had a five-year league record of 76–49–25, and won the league championship in 1980. Due to increasing competition from other soccer leagues, and decreasing attendance, the team folded in 1983. The team was resurrected in 2007 as the Pennsylvania Stoners, and competed in the National Premier Soccer League (NPSL). Based in Allentown, the team originally played its home games at J. Birney Crum Stadium. In 2008, the team captured the NPSL league championship. In 2009, the Pennsylvania Stoners played their home games at Whitehall-Coplay School District's Zephyr Sports Complex in nearby Whitehall Township. However, the team folded after the 2009 season. The former Northampton Laurels FC, of the Women's Premier Soccer League, also played at J. Birney Crum Stadium, until the team folded in 2008. The only professional soccer team in the Lehigh Valley is the FC Sonic Lehigh Valley, based in nearby Bethlehem. The PPL Building (seen here in the distance) is the tallest building in Allentown. 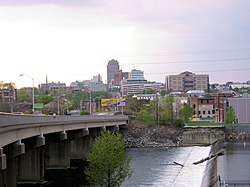 In the foreground is Allentown's Albertus L. Meyers Bridge, more commonly known as the Eighth Street Bridge. Allentown's economy has historically been manufacturing-based. The city serves as the location of corporate headquarters for several large, global companies, including Air Products & Chemicals, PPL, and others. The largest employer in Allentown is Lehigh Valley Hospital and Health Network, with more than 7,800 employees. In 2008, after more than 100 years in the city, Mack Trucks announced that their Allentown-based corporate headquarters would be relocated to Greensboro, North Carolina in 2009, though Mack continues to operate its primary manufacturing facility in neighboring Lower Macungie Township. It was expected that the move would result in the loss of approximately 600 jobs. The Center City area along Hamilton Street between 5th and 10th Streets was the primary shopping district in Allentown until the mid-1970s. The "Downtown", as it was referred to, was anchored by Hess's (9th and Hamilton); H. Leh and Company (7th and Hamilton), and Zollinger and Harned (6th and Hamilton) department stores. Along Hamilton street were scores of retail businesses; large banks; movie theaters and various small restaurants and lunch counters. On the second and third stories, professional offices could be found in many of the smaller buildings with storefronts on the first floor. Alfred L. Reichenbach, Mayor of Allentown in the late 1910s, traveled to Europe and saw beautiful hanging gardens and floral lamp posts in Paris and in some cities in Germany. He was also an amateur horticulturist and enjoyed all varieties of flowers and anyone visiting the mayor's office during his tenure would find vases of flowers for all seasons on his desk and tables. In fact, it was he who had floral boxes planted outside the mayor's window so he, and his fellow citizens, could enjoy seasonal floral designs. He believed that it would be a good way to beautify the downtown shopping district and encouraged the City Council with idea of purchasing the floral lamp posts during the renovations of Hamilton Street in 1916. Businesses generally operated from 9am to 5pm Monday-Saturday, staying open until 9pm on Thursdays and starting in the mid-1960s, also on Monday nights. Until 1952, Lehigh Valley Transit street trolleys operated east-west along the length of Hamilton Street, and also north and south along 8th Street. The major transit station downtown being at 8th & Hamilton. In the 1950s, a privately owned parking lot system (Park & Shop) to accommodate shoppers and downtown workers began to be built by razing old buildings generally within a block of Hamilton between Walnut and Linden streets, with Hamilton Street merchants providing validation for shoppers parking tickets. In the early 1970s, Hess's and Leh's built large, private multilevel covered parking decks connected to their department stores to attract customers. In 1966, the Whitehall Mall opened along MacArthur Road, just north of Allentown in Whitehall Township. It was the first enclosed shopping center north of Philadelphia when it opened. Having two major department stores (Sears & Roebuck and Zollinger and Harned) as anchor stores when it opened, its popularity led to the rise of a sprawling retail district along MacArthur Road that continued to expand into the early 1990s. After a major renovation in 1998, the Whitehall Mall's anchors included Bed, Bath & Beyond, Kohl's, and Sears. In the early 1970s, Hess's South, a satellite location of the Hess's downtown store, expanded to become the South Mall, located in South Allentown, at the city's border with Salisbury Township and Emmaus. Today, the South Mall's anchors include Gold's Gym, Petco, Staples, Stein Mart, and The Bon-Ton. In 1976, the Lehigh Valley Mall opened, just south of the Whitehall Mall, at the intersection of U.S. Route 22 and MacArthur Road. With more than 140 stores, the Lehigh Valley Mall became the largest shopping mall in the region, and presently has anchors including Boscov's, JCPenney and Macy's. A large outdoor shopping addition opened in October 2007, and includes stores such as Apple and Barnes & Noble. Most recently, The Promenade Shops at Saucon Valley, a large, upscale outdoor shopping mall, opened just south of the city, near Pennsylvania Route 309 and Interstate 78, in Upper Saucon Township. View westwards of Hamilton Mall from 6th Street, taken during the summer of 1974, shortly after its completion. The mall included overhead sidewalk and street crossing canopies at half-streets, wide sidewalks with accent lighting, freshly planted trees that lined Hamilton Boulevard from 6th to 10th Streets, and a limited, two-space drop-off, pick-up only parking area. Today, the wide brick sidewalk and trees are the mall's only remnants. By the late 1960s, the development of suburban strip shopping centers (Lehigh, Crest Plaza, Two Guys, Mountainville, and Parkway) in the area during the late 1950s and 1960s and especially the opening of the indoor Whitehall Mall in 1966 were steadily reducing the number of shoppers along Hamilton Street. Consumers preferred the convenience of easy access via automobile, and the enclosed Whitehall Mall to the pedestrian outdoor sidewalk shopping which was found along Hamilton Street. The City of Allentown hired the firm of David M. Walker Associates in 1969 to explore the needs of Center City. The 1969 Walker Report concluded that automobile traffic had taken over the downtown shopping area and that a traffic-free business district between Linden, Walnut, Sixth and Tenth Streets be developed and to convert the downtown Hamilton Street shopping area to a "Semimall", later known as "Hamilton Mall". Traffic would no longer be allowed on Hamilton Street. The intersection of Eighth and Hamilton would be closed as well as all half streets intersecting Hamilton. This would create a large pedestrian shopping "superblock" between Center Square and 9th Street, with two smaller shopping blocks between Sixth and Seventh and Ninth and Tenth. Center Square would become a large, pedestrian only area with Seventh street being reduced to one lane on each side of the Soldier's and Sailor's Monument. Hamilton Street would be completely rebuilt, with the existing street removed and replaced by a raised brick walking surface. Large, enclosing canopies would be built on each side of the street to provide shoppers protection from the weather, and small buses would operate east-west between 6th and 10th Streets picking up and dropping off shoppers to give them easy access to retail stores. During a 30-day test in April 1971, traffic on Hamilton Street was shut down between Sixth and Tenth and Lehigh Valley Transit provided small buses, free of charge for shoppers. Walnut Street, which traditionally ran one way east to west, was reversed to run west-east, with traffic along Hamilton Street being diverted south to Walnut at Twelfth street for eastbound travel. Traffic moving westbound on Hamilton Street was diverted north at Sixth, then moved west along Linden to Twelfth, then south to Hamilton, giving the center city a circular traffic flow around the pedestrian-only Center City. Problems quickly arose. It was difficult for small merchants downtown to receive deliveries, since the half streets were blocked and the narrow streets did not allow turnarounds of small delivery trucks. Also, the new restriction prohibiting automobile traffic on Hamilton Street was unpopular, and the proposed closing of the Eighth and Hamilton intersection was deemed impractical, since it blocked a major north-south route from South Allentown. Within a week, Eighth Street was reopened. The plan was also changed to allow limited two-lane automobile traffic on Hamilton Street one-way west to east, with limited drop-off and pick-up only parking. Traffic lights were installed at each major street and half street with a speed limit of 20 mph (32 km/h). The sidewalks would be expanded outwards with canopies covering them. Final plans were developed and approval was given by City Council in October 1971. Construction of Hamilton Mall began in early 1972, with construction lasting until 1974. Starting at 10th street and proceeding east, one full block at a time was closed to traffic with the existing street surface and sidewalks removed (including the old trolley tracks which had been asphalted over in the 1950s) along with the sidewalks on each side of the street. In addition, the famous downtown sidewalk street lights, which contained hanging flower gardens, were scrapped. Retail store street signs were also removed, including the large signature Hess's department store sign because they interfered with the sidewalk street canopies. The large parking areas at Center Square and comfort station under the square were also removed and turned into large brick sidewalks, along with the resurfacing of Seventh Street between Linden and Walnut Streets. The construction of Hamilton Mall caused severe disruption in the downtown shopping area for more than two years. During that time, merchants and Center City employees experienced enormous difficulties as sections of Hamilton Street were closed for months at a time. The sidewalks along Hamilton Street were reduced to single path walkways, and piles of rubble, construction material, the sounds of heavy construction equipment took over the downtown area. During the construction period shoppers tended to avoid the downtown area and shop in the suburban malls and shopping centers. Officially opened in 1974, Hamilton Mall never lived up to the expectations of the city planners. Large numbers of shoppers did not return to the downtown area. The opening of Lehigh Valley Mall in 1976 and other, smaller malls in the suburbs with outside satellite stores increased the number of businesses closing along Hamilton Street. The major expansion of MacArthur Road in Whitehall Township also led to fewer and fewer shoppers on Hamilton Mall. Improvements were made along Hamilton Mall by removing the overhead sidewalk canopies and installing a new generation of street lights, designed to replicate the hanging flower gardens of the ones removed in the construction were erected to improve the Mall's appearance. Parking meters were installed to allow longer term, but still limited parking. However, by the late 1970s, increased suburbanization led to a general decline in the popularity of the downtown shopping district. Retail shopping downtown declined with the closing of Leh's (1987) and Zollinger's (1978) downtown and culminated with the last major department store, Hess's, being sold-off in 1994, eventually being closed and subsequently demolished in 2000. Instead of a shopping Mecca, the use of downtown Allentown has turned into office buildings and increasingly has become a center-city campus for city and county government workers, along with those of PPL. Allentown-based print media include The Morning Call, the city's daily newspaper, and Pulse Weekly, an arts and entertainment newspaper. Allentown is part of the Philadelphia DMA (designated market area). The four major Philadelphia-based network stations serving Allentown include: KYW-TV (CBS), WCAU (NBC), WPVI (ABC) and WTXF (Fox). Other available Philadelphia stations include: WPHL-TV, WPSG, and others. Several New York City stations also serve the area, including WPIX and WWOR-TV. As of the 2010 census, the city was 58.5% White (43.2% non-Hispanic white), 12.5% Black or African American (11.6% non-Hispanic black), 0.8% Native American (non-Hispanic), 2.2% Asian (non-Hispanic), and 5.0% were two or more races. 42.8% of the population were of Hispanic or Latino ancestry, mostly made up of Puerto Ricans. 14.6% of the population were foreign-born. The unemployment rate for the entire Lehigh Valley area is 9.8% as of February 2010, with Allentown's unemployment rate estimated at over 10%. The median income for a household in the city was $32,016, and the median income for a family was $37,356. Males had a median income of $30,426 versus $23,882 for females. The per capita income for the city was $16,282. 18.5% of the population and 14.6% of families were below the poverty line. 29.4% of those under the age of 18 and 10.3% of those 65 and older were living below the poverty line. Elected "at-large", the mayor serves a four-year term under the city's home rule charter. The current city mayor is Democrat Ed Pawlowski, who replaced Roy C. Afflerbach after his single-term in office from 2002 to 2006. The legislative branch, the Allentown City Council, consists of seven council members elected at large for four-year staggered terms. City Council holds regular public meetings in order to enact legislation in the form of ordinances and resolutions. The current president of the City Council is Julio Guridy. The City Controller, who is responsible for the oversight of the city's finances, is also elected and serves a four-year term. Federally, Allentown is part of Pennsylvania's 15th congressional district, represented by Republican Charlie Dent, elected in 2004. The state's senior member of the United States Senate is Democrat Bob Casey, Jr.. The state's junior member of the United States Senate is Republican Pat Toomey, elected in 2010. The Governor of Pennsylvania is Republican Tom Corbett. Allentown was named the 12th most conservative in America by the non-partisan Bay Area Center. The city of Allentown is protected 24/7, 365 by the 140 paid, professional firefighters of the city of Allentown Fire Department (AFD). Established in 1870, the Allentown Fire Department is currently organized into 4 divisions of operations: Operations Division, Administration Division, Fire Prevention Division, and Education/Training Division. Each division is commanded by a Deputy Chief or an Assistant Chief. The AFD currently operates out of 6 Fire Stations, located throughout the city, under the command of a Battalion Chief per shift and a Deputy Chief. The Allentown Fire Department also operates a fire apparatus fleet of 7 Engines(including 1 Quint), 2 Trucks, 1 Haz-Mat. Unit, 1 Technical Rescue Unit, 1 Fireboat, 1 Dive Trailer, 1 Bomb Squad Unit, 1 Fire Investigation Unit, and numerous other special, support, and 3 Reserve Engines. Also, under the command of the Operations Division are 4 specilized search and rescue teams: Haz-Mat. Team, Water Rescue, Technical Rescue, and Bomb Squad. The AFD responds to approximately 6,000 emergency calls annually. Engine 4, Engine 9 Utility 57 Car 40(Chief of Department), Car 41(Deputy Chief), Car 42(Assistant Chief), Car 43(Battalion Chief), Car 45(Fire Marshal), Car 53(Callback Chief) 723 Chew St.
Engine 6 Truck 2 Ridge St. & Tilghman St.
Engine 10 Truck 1 2145 Turner St.
Engine 11(Quint) Unit 55(Haz-Mat./Mobile Command Unit) Car 48(Assistant Chief-Training) 1901 Lehigh St.
Engine 13 Fireboat 1 720 N. Irving St.
Engine 14 S. 2nd St. & Susquehanna St.
Below is a complete list of all AFD apparatus, their manufacturer and specifications, and date. The City of Allentown is served by the Allentown School District, which is the fourth largest school district in Pennsylvania, with 18,118 students (based on 2005–2006 enrollment data). The city maintains two public high schools for grades 9–12, William Allen High School, which serves students from the southern and western parts of the city, and Louis E. Dieruff High School, which serves students from the eastern and northern parts. Each of these Allentown area high schools competes athletically in the Lehigh Valley Conference. Both schools play their home football games at J. Birney Crum Stadium. Allentown School District's four middle schools, for grades 6–8, include: Francis D. Raub Middle School, Harrison-Morton Middle School, South Mountain Middle School and Trexler Middle School. The city is served by 16 elementary schools, for kindergarten through fifth grade, including: Central, Cleveland, Hiram W. Dodd, Jefferson, Lehigh Parkway, Lincoln, Luis A. Ramos, McKinley, Midway Manor, Mosser, Muhlenberg, Ritter, Roosevelt, Sheridan, Union Terrace and Washington. The Roberto Clemente Charter School, also located in the Allentown School District, is a Title I charter school which provides educational services to mainly Hispanic students in grades 6 through 12. The Allentown School District is currently undertaking a 10 year, $120 million facilities improvement plan. The plan includes renovation of all 23 schools in the district. Most of the schools to be renovated will be expanded. Two additional elementary schools and a fifth middle school are expected to be built. Allentown has two parochial high schools, Allentown Central Catholic High School and Lehigh Valley Christian High School, though both schools draw students from both Allentown and the city's suburbs. Other Allentown-based parochial schools (serving grades K-8) include: Saint John Vianney Regional School, Holy Spirit School, Lehigh Christian Academy, Mercy Special Learning Center, Our Lady Help of Christians School, Sacred Heart School, and Saint Thomas More School. The Roman Catholic-affiliated parochial schools in Allentown are operated by the Roman Catholic Diocese of Allentown. The Grace Montessori School is a pre-school and early elementary Montessori school run as an outreach of Grace Episcopal Church. The Swain School, a non-sectarian private school founded in 1929, is also located in Allentown. The city also has a private Jewish school, the Jewish Day School. The city's primary airport, Lehigh Valley International Airport (IATA: ABE, ICAO: KABE), is located three miles (5 km) northeast of Allentown in Hanover Township. Newark (New Jersey) International Airport and Philadelphia International Airport, which are within an hour to an hour-and-a-half driving distance of Allentown, provide additional flight services to Lehigh Valley residents. The region is also served by Allentown Queen City Municipal Airport (ICAO: KXLL, FAA LID: XLL), a two-runway general aviation facility located in South Allentown used predominantly by private aviation. Four expressways run through the Allentown area, with associated exits to the city: Interstate 78, which runs from Harrisburg in the west to New York City's Holland Tunnel in the east; the Northeast Extension of the Pennsylvania Turnpike, (which is part of I-476), runs from Plymouth Meeting outside Philadelphia in the south to Interstate 81 at Clarks Summit in the north; Pennsylvania Route 309, which runs from Philadelphia in the south to The Poconos in the north; and U.S. Route 22, which runs from Cincinnati, Ohio in the west to Newark, New Jersey in the east. Public parking within Allentown is managed by the Allentown Parking Authority. Public transportation within Allentown is provided by LANTA, a public bus system serving Lehigh and Northampton Counties. Several private bus lines, including Bieber Tourways, Susquehanna Trailways and Trans-Bridge Lines, provide bus service from Allentown to New York City's Port Authority Bus Terminal, Philadelphia's Greyhound Terminal, Atlantic City's Bus Terminal, and other regional locations. Allentown was a passenger train hub, served by Central Railroad of New Jersey, Lehigh and New England Railroad, Lehigh Valley Railroad the Reading Company, and later, Conrail, a conglomerate formed from many troubled northeastern railroads. Routes served Wilkes-Barre and Scranton to the north, Buffalo and Williamsport to the northwest, Reading and Harrisburg to the west, Jersey City and New York City to the east, and Philadelphia to the south. While Allentown currently has no passenger rail service (the last public rail service, which was part of the Bethlehem-Philadelphia service provided by Conrail under contract with SEPTA, ceased operating in 1979), several of the Allentown-area stations once used for passenger service have been preserved through their current commercial use. In November 2008, the Lehigh Valley Economic Development Corporation (LVEDC), along with both Lehigh and Northampton Counties, commissioned a study to explore the merits of extending the New Jersey Transit's Raritan Valley Line to the Lehigh Valley, which would potentially include stops in Allentown, Bethlehem and Easton. This would restore part of the service of the Lehigh Valley Railroad's through train, the Black Diamond, from Buffalo to New York City, which ran to 1961. Allentown and the Lehigh Valley area were once served only by the 215 area code from 1947 (when the North American Numbering Plan of the Bell System went into effect) until 1994. With the city and region's growing population, however, Allentown and its surrounding areas were afforded area code 610 in 1994. Today, the city of Allentown is covered by 610. An overlay area code, 484, was added to the 610 service area in 1999. A plan to introduce area code 835 as an additional overlay was rescinded in 2001. Electricity in Allentown is provided by PPL, also known as PP&L. UGI provides natural gas for homes. Two cable systems, RCN Corporation (originally Twin County Cable) and Service Electric Cable TV, Inc., have served the city since the 1960s. The area's only landfill, IESI Bethlehem, is located in nearby Bethlehem, Pennsylvania. Water, sewer, waste, recycling, and yard waste are controlled by the city. Dorney Park and Wildwater Kingdom's Steel Force and Thunderhawk roller coasters, just outside Allentown. Steel Force opened in 1997 as the tallest and fastest roller coaster on the East Coast of the United States, with a first drop of 205 feet (62 m) and a top speed of 75 miles per hour (121 km/h). The City of Allentown has one of the best park systems in the country. Much of the city's park system can be attributed to the efforts of industrialist Harry Clay Trexler. Inspired by the City Beautiful movement in the early 20th century, Trexler helped create West Park, a 6.59-acre (26,670 m2) park in what was then a community trash pit and sandlot baseball field in an upscale area of the city. The park, which opened in 1909, features a bandshell, designed by noted Philadelphia architect Horace Trumbauer, which has long been home to the Allentown Band and other community bands. Trexler also facilitated the development of Trexler Park, Cedar Parkway, Allentown Municipal Golf Course and the Trout Nursery in Lehigh Parkway. Trexler was also responsible for the development of the Trexler Trust, which to this day continues to provide private funding for the maintenance and development of Allentown's park system. City parks in Allentown include Bicentennial Park (4,600 seat mini-stadium built for sporting events), Cedar Creek Parkway (127 acres, including Lake Muhlenberg, Cedar Beach and the Malcolm W. Gross Memorial Rose Garden), East Side Reservoir (15 acres), Kimmets Lock Park (5 acres), Lehigh Canal Park (55 acres), Lehigh Parkway (999 acres), Old Allentown Cemetery (4 acres), Jordan Park, South Mountain Reservoir (157 acres), Trexler Memorial Park (134 acres), Trout Creek Parkway (100 acres), Joe Daddona Park (19 acres) and West Park (6.59 acres). The city has two large capacity outdoor stadiums. Coca-Cola Park, with an overall capacity of 10,000, was constructed in 2007 and is the home field for the Lehigh Valley IronPigs, the AAA-level minor league team affiliated with the Philadelphia Phillies of Major League Baseball. J. Birney Crum Stadium, used for Lehigh Valley Conference football and other purposes, has a seating capacity in excess of 15,000. An indoor arena, PPL Center, is scheduled to be completed in 2014. Other recreational sites in Allentown include Allentown Municipal Golf Course, Cedar Beach Pool, Dorney Park & Wildwater Kingdom, Fountain Pool, Irving Pool, Jordan Pool and Mack Pool. Sarah Knauss, supercentenarian, longest-lived American ever, 2nd oldest person verified to have ever lived. Allentown is mentioned in the 2011 movie The Hangover Part II when Ed Helms sings a modified cover of Billy Joel's song "Allentown". In Season 4, Episode 14 ("Memento Mori") of the X-Files, broadcast February 9, 1997, Mulder and Scully travel to Allentown to find women who might know how to cure Scully's cancer. 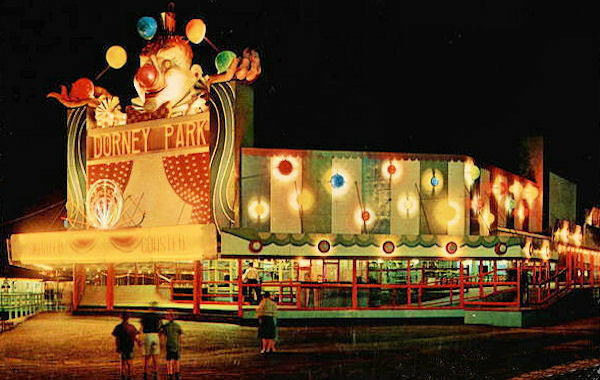 Allentown's Dorney Park was a film location for John Waters' Hairspray, released in 1988. Allentown is the hometown of up and coming showgirl Peggy Sawyer in the long-running, Tony Award-winning Broadway musical 42nd Street, released in 1980, and its associated Academy Award-nominated movie. When Sawyer expresses her desire to leave Broadway to return to Allentown, the show's director and entire cast successfully dissuade her by singing the famed musical number "The Lullaby of Broadway." Allentown was the film location for much of James Neilson's film Where Angels Go, Trouble Follows, released in 1969. In the 1960 musical Bye Bye Birdie, character Rosie Alvarez is from Allentown. In the song "Spanish Rose," she sings: "I'm just a Spanish Tamale according to Mae/ Right off the boat from the tropics, far, far away/ Which is kinda funny, since where I come from is Allentown, PA."
19th Street Theatre (opened 1928), 527 N. 19th St. Home of Civic Theatre of Allentown, which stages plays and hosts fine arts film series. Albertus L. Meyers Bridge (built 1913), 8th & Union Sts. Also known as the Eighth Street Bridge, once the longest and highest concrete bridge in the world. Allentown Art Museum (built 1934), 31 N. 5th St. Collection of over 13,000 works of art, along with an associated library. Allentown Cemetery Park (established 1765), 10th & Linden Sts. Burial site of the city's earliest residents, including American Revolutionary War and War of 1812 veterans. Allentown Fairgrounds (established 1889), 400 N. 17th St. Home of the Allentown Fair (started 1852), Allentown Farmers Market, Agri-Plex exhibit hall and The Ritz restaurant. Allentown Post Office (built 1933–34), 5th & Hamilton Sts. Classical Moderne-style building with Art Deco ornamentation. Interior murals of local historical scenes by New York artist Gifford Reynolds Beal. Allentown Symphony Hall (built 1896), 23 N. 6th St. Owned by the Allentown Symphony Association, a 1200-seat performing arts facility that is home to the Allentown Symphony Orchestra, as well as Pennsylvania Sinfonia, Community Concerts of Allentown, Allentown Band and Community Music School of the Lehigh Valley. Bogert's Covered Bridge (built 1841), S. 24th St. & Fish Hatchery Rd. One of the region's oldest covered bridges, a 145-foot (44 m) span over the Little Lehigh Creek in Allentown's Lehigh Parkway. Frank Buchman House, 117 N. 11th St. Home of Frank N. D. Buchman (1878–1961), founder of the Oxford Group and Moral Re-Armament religious movements. Butz-Groff House (built 1872), 111 N. 4th St. Dark stone Victorian home in what was once the center of Allentown's most fashionable residential district. Built by attorney Samuel A. Butz and later owned by his grandson, Joseph C. Groff. Cedar Crest College (founded 1867), 100 College Dr. Liberal arts college with an 84-acre (340,000 m2) campus on the city's western edge. Centre Square and Soldiers & Sailors Monument (built 1899), 7th & Hamilton Sts. Monument honoring American Civil War veterans from the 47th Regiment Pennsylvania Volunteers. William F. Curtis Arboretum (started 1915), 100 College Dr. Located at Cedar Crest College, a collection of 140 species of trees registered with the American Public Gardens Association. Earl F. Hunsicker Bicentennial Park (built 1939, renovated 1976), Lehigh & S. Howard Sts. Originally Fairview Field, home to the city's Minor League Baseball teams, 1939–47. As Bicentennial Park, hosted the Allentown Ambassadors, 1997–2003. Hess's Department Store (closed 1996 and demolished in 2000). Homeopathic Healing Art Plaque, 31 S. Penn St. Marks the location of the world's first medical college exclusively devoted to the practice of homeopathic medicine. Established in 1835, the college went bankrupt in 1845 and relocated to Philadelphia, where it developed into what is today Hahnemann University Hospital. J. Birney Crum Stadium (built 1948), 22nd & Turner Sts. Home football field of Allentown's three high schools, a 15,000-capacity stadium once the largest in Pennsylvania. Muhlenberg College (founded 1848), 2400 Chew St. Liberal arts college located on an 81-acre (328,000 m2) campus in Allentown's West End. Old Allentown Cemetery (established 1846), N. Fountain & Linden Sts. City's second oldest cemetery, located next to Allentown Cemetery Park. Burial site of Tilghman Good (1830–87), two-term mayor and commander of the 47th Regiment Pennsylvania Volunteers during the American Civil War. Old Zion Reformed Church and Liberty Bell Shrine Museum, 622 Hamilton St. Located on Hamilton Street in center city Allentown, the temporary hiding place of the Liberty Bell in 1777–78 during the Revolutionary War. Portland Place (built 1902), 718 Hamilton St. Former headquarters of Lehigh Portland Cement Company, remodeled in the art deco style in 1939–40. Over the front door was a glass relief by artist Oronzio Maldarelli, the largest glass mural panel in the world at the time. When the company (now Lehigh Cement Company) relocated, the sculpture was installed in the building's new lobby. PPL Building (built 1928), 9th & Hamilton Sts. Allentown's tallest building (23 stories), headquarters to PPL Corporation. In 2008, PPL created a Peregrin Falcon nesting platform outside it's 23rd floor. Revolutionary War Plaque (erected 1926), 8th & Hamilton Sts. On the side of the Farr Building, marks the site of a hospital for Revolutionary War soldiers in 1777–78. Sterling Hotel (1890), 343–45 Hamilton St. Three-story, Romanesque Revival brick hotel. Now a popular bar and music venue. Placed on the National Register of Historic Places, 1984. Trout Hall (built 1770), 414 Walnut St. Oldest house in Allentown, built by James Allen, son of William Allen, the city's founder. Yocco's Hot Dogs (opened 1922). Regionally-popular restaurant chain with six Lehigh Valley locations, including three in Allentown. ^ Whelan, Frank (May 7, 1991). "'Cement City' Moniker Is A Mystery American Heritage Says Label Was Allentown's.". The Morning Call: pp. B.03 . "Queen City's origins as an Allentown nickname are obscure. It is believed to come from a turn-of-the-century competition hosted by the Allentown Chamber of Commerce. The winning entry was said to be Queen City." ^ Salter, Rosa (April 20, 2003). "Two in tune with the times ** At 175, Allentown Band, America's oldest, preserves best of tradition.". The Morning Call: pp. E.01 . "1967: Allentown named Band City-U.S.A"
^ Whelan, Frank (March 13, 2002). "Hamilton Street used to be thick with peanut shells ** And Allentown's Army Camp Crane once had a popular commander.". The Morning Call: pp. B.04 . "Allentown's title as the Peanut City goes back to the late 19th and early 20th century when large amounts of them were eaten in the Lehigh Valley. From the 1880s to the 1920s, vendors lined Hamilton Street, singing jingles in Pennsylvania Dutch about the superior quality of their peanuts. Former Call-Chronicle Sunday editor John Y. Kohl recalled in 1967 that the peanuts were eaten mostly by young men and boys who would walk Hamilton Street on Saturday nights flirting with girls and 'throwing the shells about with complete abandon.' Sunday morning sidewalks were 'not quite ankle deep' in shells. Merchants would get up early to sweep them into the gutter so churchgoers would not have to wade through them.'" ^ Whelan, Frank (May 7, 1991). "Cement City' Moniker Is A Mystery American Heritage Says Label Was Allentown's.". The Morning Call: pp. B.03 . "Silk City for example, is a throwback to the late 19th and early 20th century, when Allentown was known for its many silk mills. Although the last mill closed a few years ago, the name hangs on in the minds of older residents." ^ "U.S. Census Bureau Delivers Pennsylvania's 2010 Census Population Totals". http://2010.census.gov/news/releases/operations/cb11-cn74.html. ^ "About Lehigh County". Lehigh County official website. Archived from the original on June 15, 2006. http://www.lehighcounty.org/index.cfm?doc=about_lc.htm. Retrieved June 8, 2006. ^ "Phoenix drops to 6th largest city". http://www.azcentral.com/news/articles/2011/03/13/20110313phoenix-6th-largest-city-philadelphia.html. ^ a b Aug 16, 2005 12:00 AM (August 16, 2005). "Study Ranks America's Most Liberal and Conservative Cities". Govpro.com. http://govpro.com/content/gov_imp_31439/. Retrieved December 7, 2011. ^ a b c d e f Gordon, L.C., ed (1916). Allentown 1916. Allentown, Pennsylvania. ^ a b Roberts, Charles R. (1908). "William Allen, the Founder of Allentown, and His Descendants" (PDF). Proceedings of the Lehigh County Historical Society (1st): 22–43. Retrieved on August 17, 2008. ^ "Lehigh County – 4th class" (PDF). Pennsylvania Historical and Museum Commission. Archived from the original on June 29, 2007. http://www.phmc.state.pa.us/bah/dam/counties/pdfs/Lehigh.pdf. Retrieved June 3, 2007. ^ "Horlacher Brewing Company". Archived from the original on June 7, 2007. http://www.falstaffbrewing.com/horlacher.htm. Retrieved June 1, 2007. ^ "Neuweiler Brewery". http://pabreweryhistorians.tripod.com/neuweiler.html. Retrieved June 1, 2007. ^ "$44 Million Guinness Investment Will Create 250 Jobs at Pennsylvania Brewery". Archived from the original on June 29, 2007. http://www.siteselection.com/ssinsider/pwatch/pw011203.htm. Retrieved June 1, 2007. ^ "Sam Adams purchases Upper Macungie Twp. plant for $55 M". http://blog.pennlive.com/lvbreakingnews/2007/08/sam_adams_purchases_upper_macu.html. Retrieved January 12, 2011. ^ "Normal Monthly Precipitation, Inches". Archived from the original on November 13, 2006. http://www.met.utah.edu/jhorel/html/wx/climate/normrain.html. Retrieved November 4, 2006. ^ "Snowfall – Average Total In Inches". Archived from the original on November 15, 2006. http://lwf.ncdc.noaa.gov/oa/climate/online/ccd/snowfall.html. Retrieved November 4, 2006. ^ "Average Days of Precipitation, .01 cm or more". Archived from the original on November 3, 2006. http://www.met.utah.edu/jhorel/html/wx/climate/daysrain.html. Retrieved November 4, 2006. ^ "Average Monthly Precipitation". Archived from the original on November 13, 2006. http://www.met.utah.edu/jhorel/html/wx/climate/normrain.html. Retrieved November 4, 2006. ^ Kraus, Scott; Assad, Matt (February 4, 2012). "Allentown Hockey Arena Costs Adding Up". The Morning Call. http://articles.mcall.com/2012-02-04/news/mc-allentown-hockey-arena-tab-20120203_1_hockey-arena-neighborhood-improvement-zone-acida. Retrieved August 17, 2012. ^ Kraus, Scott (July 11, 2012). "Arena on Track to Rise in Fall With Pennsylvania Steel". The Morning Call. http://articles.mcall.com/2012-07-11/news/mc-allentown-arena-construction-20120711_1_neighborhood-improvement-zone-sara-hailstone-acida. Retrieved August 17, 2012. ^ Whelan, Frank (June 29, 2003). "'Band' plays on words and pictures to tell informal history". The Morning Call: pp. E.! ^ ""Minor league park was a major hit," Morning Call, March 30, 2008". http://www.mcall.com/sports/all-ironpigs-special-033008-heffner,0,4139387.story. Retrieved May 5, 2008. ^ Allentown council authorizes use of eminent domain for hockey arena if needed. lehighvalleylive.com. Retrieved on 2013-07-23. ^ "Air Products Web Page Listing of Corporate Headquarters". Archived from the original on November 1, 2008. http://www.airproducts.com/Contacts/Regional/default.htm. Retrieved October 31, 2008. ^ "Lehigh Valley Economic Development Corporation – Largest Lehigh Valley Employers" (PDF). Archived from the original on June 29, 2007. http://www.lehighvalley.org/pdf/Employ_Largest.pdf. Retrieved June 1, 2007. ^ "100 Best Companies to Work for 2007: Lehigh Valley Hospital & Health Network". CNN. Archived from the original on June 2, 2007. http://web.archive.org/web/20070602052550/http://money.cnn.com/magazines/fortune/bestcompanies/2007/snapshots/80.html. Retrieved June 1, 2007. ^ "2007 Top 100 Daily Newspapers in the U.S. by Circulation" (PDF). BurrellesLuce. March 31, 2007. Archived from the original on June 4, 2007. http://www.burrellesluce.com/top100/2007_Top_100List.pdf. Retrieved May 31, 2007. ^ "TV Market Maps". Echostar Knowledge Base website. http://www.dishuser.org/TVMarkets/. Retrieved April 20, 2009. ^ "About WFMZ-TV". WFMZ-TV official website. Archived from the original on May 23, 2008. http://web.archive.org/web/20080523075919/http://www.wfmz.com/about.html. Retrieved June 8, 2008. ^ "About Us". WBPH-TV official website. Archived from the original on June 17, 2008. http://www.wbph.org/. Retrieved June 8, 2008. ^ "Home Page". WLVT-TV official website. Archived from the original on June 15, 2008. http://www.wlvt.org. Retrieved June 8, 2008. ^ "StationRatings.com – Allentown/Bethlehem, PA". http://stationratings.com/ratings.asp?market=145. Retrieved May 11, 2008. ^ a b "City of Allentown – City Controller". Archived from the original on June 10, 2008. http://www.allentownpa.gov/Home/AboutAllentown/tabid/196/Default.aspx. Retrieved June 19, 2008. ^ "City of Allentown – City Council Members". Archived from the original on July 3, 2008. http://www.allentownpa.gov/Government/CityCouncil/CouncilMembers/tabid/206/Default.aspx. Retrieved June 19, 2008. ^ "City of Allentown – City Controller". http://www.allentownpa.gov/Government/CityController/tabid/132/Default.aspx. Retrieved June 19, 2008. ^ a b "Uniform Crime Reporting Statistics". U.S. Federal Government. http://bjs.ojp.usdoj.gov/ucrdata/Search/Crime/State/StateCrime.cfm. Retrieved April 11, 2012. ^ Fire. Allentownpa.gov. Retrieved on 2013-07-23. ^ About. Allentownpa.gov. Retrieved on 2013-07-23. ^ Special Teams. Allentownpa.gov. Retrieved on 2013-07-23. ^ "Public School Districts". National Center for Education Statistics, U.S. Department of Education (2005–06 School Year). http://nces.ed.gov/ccd/districtsearch/district_list.asp?Search=1&details=1&InstName=&DistrictID=&Address=&City=&State=42&Zip=&Miles=&County=&PhoneAreaCode=&Phone=&DistrictType=1&DistrictType=2&DistrictType=3&DistrictType=4&DistrictType=5&DistrictType=6&DistrictType=7&NumOfStudents=15000&NumOfStudentsRange=more&NumOfSchools=&NumOfSchoolsRange=more. Retrieved November 6, 2008. ^ "Course/Programs". Lehigh Carbon Community College. http://www.lccc.edu/coursesprograms/. Retrieved August 1, 2009. ^ "County eyes N.J. rail extension to area," The Morning Call, November 7, 2008. ^ The Black Diamond. American-rails.com. Retrieved on 2013-07-23. ^ "Norfolk Southern Corporate Profile". http://www.nscorp.com/nscportal/nscorp/Media/Corporate%20Profile/;jsessionid=Cff4GgpYGNc11LGyG1zMtKX0vKpN91jFcThnpFYFSTffvyYhY1YY!-697845123. Retrieved June 22, 2007. ^ "R.J. Corman Railroad Group Allentown Lines". Archived from the original on August 3, 2007. http://www.rjcorman.com/allentown.htm. Retrieved June 22, 2007. ^ Moss, Linda (August 1, 2005). "In the Keystone State, Service Electric Thrives". Multichannel News. http://www.multichannel.com/article/CA631093.html. Retrieved June 8, 2008. ^ "Rollercoaster Database: Steel Force (Dorney Park & Wildwater Kingdom)". http://www.rcdb.com/id276.htm. Retrieved July 10, 2008. ^ a b "Allentown, PA – Parks". Archived from the original on June 10, 2007. http://www.allentownpa.org/parks.htm. Retrieved June 2, 2007. ^ "Mayfair Festival of the Arts"
^ "Stadium Info". Lehigh Valley IronPigs official website. March 8, 2007. pp. A1. http://www.ironpigsbaseball.com/cocacola/faq/#13. Retrieved March 8, 2007. ^ Stanley, Tim. "Mildred Ladner Thompson 1918–2013: Former Tulsa World columnist witnessed history". Tulsa World (2013-07-07). http://www.tulsaworld.com/article.aspx/Mildred_Ladner_Thompson_1918_2013_Former_Tulsa_World/20130707_11_A17_CUTLIN575368?r=1383. Retrieved July 16, 2013. ^ "A Mini-History of the 19th Street Theatre". Civic Theatre of Allentown official website. Archived from the original on May 9, 2008. http://www.civictheatre.com/history/hist19th.html. Retrieved June 2, 2008. ^ a b c d e f "Historical Allentown". City of Allentown official website. http://www.allentownpa.gov/Visitors/HistoricalAllentown/tabid/72/Default.as. Retrieved May 30, 2008. ^ "Allentown Fair". Official website. Archived from the original on May 9, 2008. http://www.allentownfairpa.org/index.html. Retrieved June 1, 2008. ^ "The Post Office – A Community Icon" (PDF). Commonwealth of Pennsylvania. Archived from the original on June 26, 2008. http://www.portal.state.pa.us/portal/server.pt/gateway/PTARGS_0_2_23285_2805_357375_43/http%3B/pubcontent.state.pa.us/publishedcontent/publish/cop_environment/phmc/communities/extranet/preservationprograms/75thnewdeal/ndarchtch2ucontent/full_study.pdf. Retrieved June 1, 2008. ^ "About Symphony Hall". Allentown Symphony Association official website. http://www.allentownsymphony.org/ABOUTSYMPHONYHALL/tabid/192/Default.aspx. Retrieved June 1, 2008. ^ "Covered Bridges of the Lehigh Valley" (PDF). Lehigh Valley Visitors and Convention Bureau. Archived from the original on June 26, 2008. http://web.archive.org/web/20080626185844/http://www.lehighvalleypa.org/resource/pdf/Covered_Bridge.pdf. Retrieved June 1, 2008. ^ "Cedar Crest At-a-Glance". Cedar Crest College official website. Archived from the original on May 2, 2008. http://web.archive.org/web/20080502144148/http://www.cedarcrest.edu/Redesign/Home+Page/ataglance_frameset.asp. Retrieved June 1, 2008. ^ Hartman, William L. (1908). "The Mayors of Allentown" (PDF). Proceedings of the Lehigh County Historical Society (1st): 205–218. Retrieved on May 30, 2008. ^ "William F. Curtis Arboretum: Mission/History". Cedar Crest College official website. Archived from the original on May 2, 2008. http://web.archive.org/web/20080502143115/http://www.cedarcrest.edu/Redesign/arboretum/history.asp. Retrieved May 30, 2008. ^ ""Archives: Past Editorials on baseball’s departure from the Lehigh Valley", Morning Call, March 30, 2008 (originally published December 5, 1960)". http://www.mcall.com/sports/baseball/ironpigs/all-ironpigs-special-033008-archives,0,5271795.story. Retrieved March 30, 2008. ^ "Admission: Frequently Asked Questions". Muhlenberg College official website. Archived from the original on May 9, 2008. http://web.archive.org/web/20080509062103/http://www.muhlenberg.edu/admissions/facts.html. Retrieved June 1, 2008. ^ "History". Liberty Bell Shrine official website. http://www.libertybellmuseum.org/museum/timeline.html. Retrieved June 2, 2008. ^ "PPL History: 1920s". PPL Corporation official website. Archived from the original on May 9, 2008. http://www.pplweb.com/about/our+history/1920s.htm. Retrieved May 30, 2008. ^ "Hotel Sterling". Archiplanet website. http://www.archiplanet.org/wiki/Hotel_Sterling. Retrieved September 6, 2008. ^ Lehigh County Historical Society and Lehigh Valley Heritage Center Museum Official Web Site. City of Allentown – PA – Official Site. This page uses content from the English language Wikipedia. The original content was at Allentown, Pennsylvania. The list of authors can be seen in the page history. As with this Familypedia wiki, the content of Wikipedia is available under the Creative Commons License.